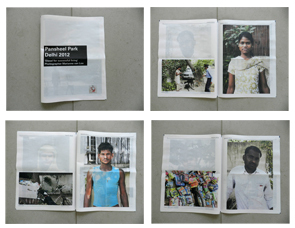 "Exploration of workers and their jobs in Pansheel Park, New Delhi. Once India starts allowing companies such as Wall Mart and Tesco into their country, critics fear that this will destroy millions of jobs. Where in the Western world can you still find a man that just sells tomatoes, or some plastic toys from the back of a bike? Most of these jobs will disappear in the future because of India's growing economic wealth. This is a visual record of a current social climate."